16 yr Balsamic Barrel for sale. Buy online at Zingerman's Mail Order. Gourmet Gifts. Food Gifts. Sixteen year balsamic in your own oak barrel. The aging attics of La Vecchia Dispensa in the town of Castelvetro, near Modena, are stuffed with barrels. Old barrels, new barrels. Small ones for precious cargo, large ones for just-cooked must. 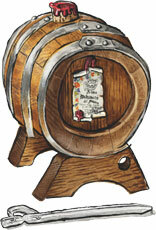 Made from chestnut, oak, and half a dozen other woods, each of them holds balsamic vinegar at some advanced age. Sounds romantic, doesn't it? Want one for yourself? La Vecchia Dispensa's cooper has fashioned a few small, seasoned oak barrels filled with over a quart of our exclusive 16 year aged balsamic. Use the glass dropper to rescue a bit of balsamic for salads or strawberries. Kept corked, it'll last indefinitely and get better with time, just like you. Keep in mind that in Italy, balsamic was a gift for grandchildren or important dowries. Just something to consider. Quantities limited. Refill as needed, though you'll want to keep it topped up to keep the barrel staves moist and to prevent leaking.